minutes if all parts are available. The circuit require no power because it runs from the radio waves it receives. This simple crystal radio circuit will receive many near by radio stations and also receiver far radio stations which have strong signals. Now start building the radio and first make coil, for making the coil use toilet roll or PVC pipe and then wind 80 turns of enameled copper wire on that roll. When winding is completed secure it with gule or sticky tape. Do not forget to scrape the wire enamel from both ends of the enameled wire with knife because all enameled wires are coated with enamel material and we have to remove that material to make connection. After completing the coil connect all parts like germinium diode, variable capacitor, coil and ear piece together to make a crystal radio as shown in the circuit diagram. After building the radio connect a longest antenna wire to the radio circuit as shown in the picture and take it outside to the window and attach it to any tree or just put it out from the window. You will also need to make an earth connection to the radio circuit for this connect a wire with the ground connection of the radio circuit and attach it with cold water pipe or water tap with crocodile clip. A good earth connection is require for a crystal receiver to work properly. I found it works better with earth connection but I have also noticed good results without earth connection. When all done correctly as described, pick up the earpiece and listen, you will hear some noises, adjust the screw on the variable capacitor until you hear any station sound. You can hear many stations on this crystal receiver circuit depending your location, and the length of the antenna wire. If you are receiving very low sound in the earpiece try unwinding 4 to 5 turns of the coil. This is a basic and beginner circuit of radio so you have to make some small experiments to get better performance patiently, this will also increase your knowledge in electronics and you also understand how a radio works. Earpiece: The circuit require crystal earpiece or high impedance headphones. Coil: 80 turns of 26 s.w.g. Enameled copper wire wound on an empty card board toilet roll or an off cut piece of plastic waste pipe. 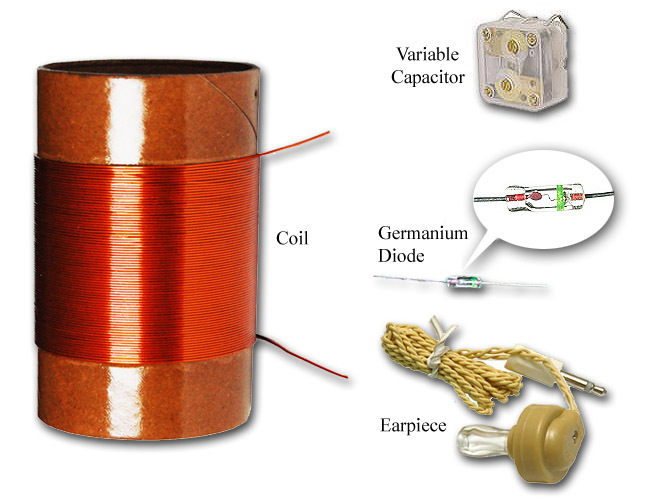 Try different coils you can also experiment with the coil found in AM / MW radio receiver. Variable Capacitor: 365pF variable capacitor buy new one or use from scrap AM / MW radio receiver. Make sure to connect the variable capacitor correctly. Wooden Base: Use a wooden base of 6x6 or any size to mount the circuit parts on it.